Is New Atheism Missing the Point of Religion? This week, I’d like to examine exactly what it is that the New Atheists are attacking when they go on the offensive against religion. For those who are not familiar with New Atheism, it is the unofficial name for proactive atheism, often given to public figures like Richard Dawkins, Sam Harris, Christopher Hitchens, and the like. These men, and other people like them, are after religion in all of its forms. In light of an ongoing debate I have been engaged in recently, I think that the term ‘religion’ may be problematically vague. If this is the case, then the New Atheists (and myself) may be railing against a strawman that is undeserving of our attention and is an unfair characterization of our opponent's beliefs. What is the essence of ‘religion’ and is it something on which it makes sense to wage intellectual war? Try and define, for yourself, what religion is in and of itself. The obvious answer to the question is the easiest to give: simply point to a given religious tradition and state that that is what religion is. For instance, Christianity is at its core a belief system based on monotheism; redemption of one’s immortal soul through the blood sacrifice of Jesus; and a series of commandments, proscriptions, prohibitions and guidelines by which people are told to live their lives. 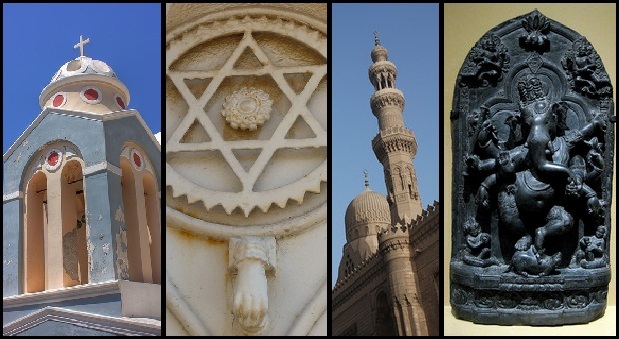 Judaism, Islam and Hinduism (to highlight the world’s largest religions) follow a similar model, even if the specific details differ. Is this sort of belief system fundamentally what religion is, qua religion, or are we getting distracted by the particulars here? If we dispose of the specific tenets of any given tradition and try to get to the heart of the matter, what is it that we are left with? How far down are we to dig in our effort to get to religious rock-bottom? I’m sure we can do away with things like angels, jinn, avatars, dietary proscriptions and taboos, dictates on what to wear, where to go, or with whom we are to mingle. Granting that, is belief in an afterlife or some immaterial component of our person-hood (such as a soul) necessary? There are certainly systems that did not advance the norm of an afterlife or immortality as is often a part of religious traditions today. Judaism has nothing explicit about it mentioned in the Torah, for instance, and this tradition is the ancestor of both Christianity and Islam. We've barely started our proverbial spring cleaning and our house of worship is starting to look pretty base. I imagine our stripped-down version of Hinduism is going to look pretty damn close to Christianity, or any other religion. What would be left to tell them apart having done away with all of the characteristics that make them outwardly identifiable? We have discarded so much that it seems a belief in god(s) is the only thing left that is generally considered a core component of religion. If we continue our Cartesian dismissal even farther, we can throw out any particular characteristics of this (or these) god(s). Is there only one, or are there many? This too is a divisive issue, so we can remain quiet on that question and simply say that there is a level of being above our own occupied by something(s). Whether or not this level of being is causally related to the birth of reality as we know it varies from tradition to tradition, so we cannot even say anything about this that will hold true of all religions. And what of something like Buddhism, that does not have much (if anything) to say about god(s)? Perhaps even the small concession - that god(s) exist(s) - is too great to give if we are looking for the essence of religion. Perhaps we are coming at this the wrong way. Maybe it is not so much about what people believe, but about what people should be and how they should act towards one another. After all, I've often heard that God is love (or something akin to this) and love is definitively concerned with the relationships between persons. As much as I think that people want this to be what religion is fundamentally about, I cannot see how it can make this claim. There are beautiful artistic works that exalt the goodness of humanity and implore us to be better people than we may often be. Poetry alone seems sufficient to capture the same depth of human experience as any given religious text and that is but one small subset of literary art. If we can come to the same truths through poetry, then how can these truths be at the heart of religion? If religion has no particular claim on topics of ethics, morality, forgiveness, kindness or decency, then how can we claim that that these are the things that are the essence of religion? At this point it should be obvious that religion as it is generally understood seems to have disappeared completely. I cannot recognize religion without at least some mixture of these normal religious ideas (spirits, gods, afterlife, moral proscriptions, etc.) underpinning the concept. Imagine discarding the precepts of Christianity and then asking a Southern Baptist or a Catholic if this gutted belief system is still to be considered a religion. I can hardly imagine that the answer would be yes. One might counter that the spiritual essence of religion is still intact, even after all of the specific attributes have been removed. This seems to play to the strengths of mysticism, a tradition that is generally not about specific beliefs, but rather about the feeling or subjective experiences of its practitioners. One wrapped up in an ecstatic revelation during a sublime conjoining of your essence with that of the Almighty can hardly be said to be preoccupied with the concern that their next meal might not be kosher. Fair enough, I say. But this issue is that we already have a term for this, and it is spirituality. If we have pulled spiritual experiences or beliefs away from religious ones in our conceptual schemes, then it seems bizarre to claim that the essence of religion is spirituality. Why would we need to make the distinction if there is not something meaningful about the differences between these two ideas? I believe this distinction is important, and ultimately telling. If we cannot strip away the beliefs that make up a religion without inevitably hitting spiritual bedrock, then it seems that the entire religious enterprise is superfluous. The objective traits of religion become meaningless, which seems to render the outward form of any religion equally so. The massive human undertaking that has created religious institutions has been for naught or has at least been quite beside the point. I’m sure that most religious people would immediately call me out on this claim. For religions that are steeped in ritual and tradition, discarding those practices and beliefs would be sacrilege. Can you honestly imagine the Catholic Church without priests, the Eucharist, baptism, holy water, and so on? Removing these from that equation would certainly yield an institution that is fundamentally different from that of the Church as we have known it historically and as we know it today. People have died over these beliefs for the very reason that these people believe they are the essence of their religion. How many died during the Protestant Reformation over an argument that was, in a way, a dispute over whether or not the bread and wine of the Eucharist literally became their Lord and Savior? To dismiss the particular dogmas that are at the core of so many peoples’ religious life seems untenable as a strategy to get to the essence of religion. After leveling this objection, it has been said to me that there is no mandate that says that the practices of the masses should be held in special regard. After all, religion has its own experts, just as any field of inquiry will have. Why would we defer the defining of religion to the general populous when we have experts who hold a wholly different view on the subject? While I am certainly willing grant that the religion of theologians and philosophers will be vastly different in scope and depth that that as practiced by lay practitioners, I can hardly see how this is an adequate way to circumvent the problem. My reason is simple: the religion of theologians often bears little resemblance to popular religion. For a historical example, Baruch Spinoza’s theology was so unrecognizable by his Jewish compatriots that he was shunned by his community. The Catholic Church later followed suit and placed his works within the Index of Forbidden Books. Even for a man whose works have been as thoroughly studied as Spinoza, it seems wrong to give his conception of religion any more weight than the multitudes that scorned him. Even more fundamentally, why should be give experts in this field any more credit that the uneducated? Expertise in worldly fields of study has the advantage of being independently verifiable. People are not generally interested in trusting their lives to the products of amateurs: would you feel comfortable living in a high rise designed by someone who just picked up architecture a few weeks ago? Even the philosophers of old who made grand claims about the nature of reality can and have been dismissed based on how those claims have been borne out against the trials and tribulations of history, philosophical argument, and science. Religion can claim no such way of differentiating the practices of the learned from those of the lay people. There seems to be no objective way of determining who has the religious opinion that counts. Often, people seem to be having completely different discussions, even when these discussions take place within the same religious tradition. So, where are we now? I think that the effort to find the essence of religion has shown how problematic this notion of religion qua religion is if we attempt to do away with all of the usual religious trappings. If the specific beliefs of a religion prove to be important, then we are effectively back where we started. Consider this: Christian doctrine has certain core beliefs that simply cannot be dismissed if we hope to retain the essence of Christianity. If we hold that Christianity is representative of a religion, and that the other religious traditions of the world are similar in this regard, then how can we say that the very things they are supposed to be about are irrelevant to religion in its essence? Until a sufficient definition of religion (or even the hint of what that definition might be about) is put forth, then I think it is disingenuous to dismiss New Atheists because they attack the specific beliefs of the world’s religions. These beliefs have proven important to the people that believe them. How many have died over disputes over which prophet said what, or which sect had a true handle on the interpretation a particular holy book? While we have the option to dismiss these people for failing to understand the essence of religion, I think those who would do so are obligated to show how it is that these prophets have missed the point. Better still, I’d like a clue as to what (or even just in what direction) the point is! Furthermore, I think that most proactive atheists would be willing to disengage by the time religion is disembodied from its current corporeal incarnations. If we remove the very things that make religions publicly recognizable, then when exactly are we attempting to do battle with? For example, I have a problem with religious groups that lobby to keep gay marriage illegal or who claim the authority to deny their children medical care; I have no qualms with someone who has some spiritual belief or understanding they have come to but that do not manifest themselves in publicly accessible ways. I myself have had experiences I describe as spiritual; perhaps while reading a particular story, or while staring up at a cloudless night sky. These are very human experiences and I am absolutely not attacking them. I am after religion as it is usually understood by the very people who claim to practice it in one form or another; systems of belief that make themselves known in the world and which seem to be engines for intolerance, subjugation of our fellow human beings, misinformation, distrust, anxiety, and fear. There are obviously many positive experiences to be had thanks to religion, but I do not think religion is something to be tolerated given the negative attributes. If nothing else, it is too easily abused or misused at the expense of human well-being, and this is something against which I am happy to speak. I believe New Atheists like Dawkins and Harris interpret what religion qua religion is the same way I (and many, many others) do, and until we are given sufficient reason to demonstrate that we are simply missing the point, the onus is on those who cry foul to prove it. Follow me on Twitter and Google+ and check back weekly for new articles and podcasts. You can also follow [37G] on Facebook, Twitter, Google+, or YouTube. Featured photo is a composite of images provided by Flickr users Klearchos Kapoutsis, zeevveez, wilhelmja, and Hartmannia.